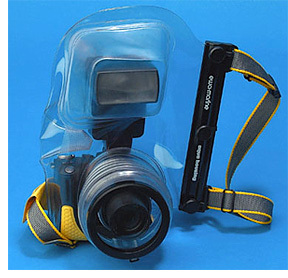 Submersible Camera Bag | OhGizmo! By Andrew Liszewski on 08/23/06 • Leave a comment! In previous posts I’ve lamented at the extreme cost of underwater housings for cameras, especially for larger SLRs. While it makes sense that you really don’t want to cheap out on protection if you intend to completely submerge your electronics it also means that most hobby photographers never get the chance to try their hand at underwater photography. However it seems Ewa-Marine currently sells an affordable and extremely durable PVC bag that will accomodate almost any piece of camera or video gear you want to take down to the murky depths. While the bag doesn’t really give the user full access to all of their camera’s various controls the transparent and flexible PVC material still allows most buttons to be easily pressed. Most of the Ewa-Marine bags are submersible up to 30 feet but some can even be taken as deep as 150 feet. Prices range from about $100 for bags designed for point & shoot cameras and up to about $350 for SLR bags.